On Tax Day this year I found myself flying into Dulles International Airport. There was some turbulence, but our landing under the direction of the FAA-trained traffic controller was silken smooth. As we taxied to the gate, we passed the space shuttle Discovery, still piggy-backed on its 747 shuttle waiting for enshrinement at the Smithsonian National Air and Space Museum near the airport. 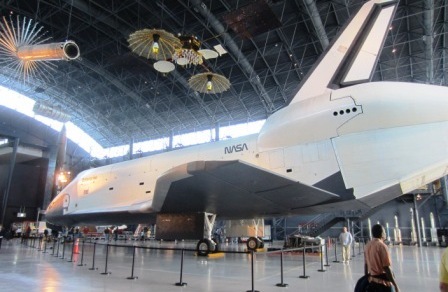 The next day we spent several hours in the museum, guided by a volunteer docent brimming with anecdotes and information about the jet planes, rockets, satellites, and space exploration – so many achievements that were only made possible by a wartime or Cold War-time national commitment. That afternoon we proceeded through the springtime electric green east coast countryside on US routes 15 and 30 to Gettysburg and its marvelously evocative National Battlefield. 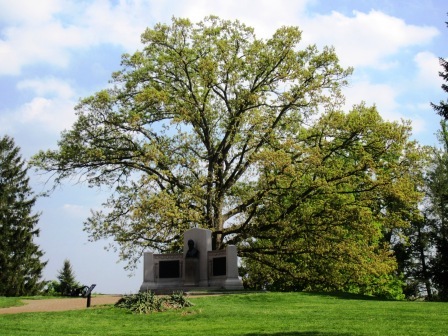 The landscape is meticulously preserved as it appeared in Matthew Brady’s historic photographs taken only a few days after the battle almost 150 years ago. Again, park rangers were available at major points to tell an audience of school children, Boy and Girl Scouts, parents, and other tourists about what happened here that formed our national consciousness. We had previously visited the Park Department’s Visitor’s Center which offers both panoramic and microscopic information about the politics, military strategy, soldier life and every other aspect of the battle that one could imagine. The famous Cyclorama 360 degree painting is there along with a short film about slavery that will bring a tear to the most jaded eye. The next day we took my centenarian mother-in-law, who raised her family in Gettysburg, to visit her favorite spots on the battlefield. 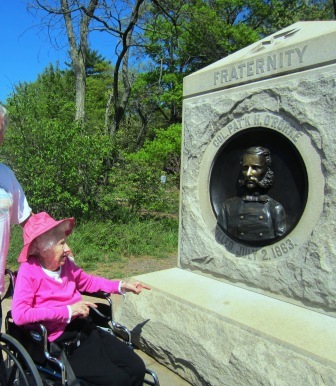 Thanks to the improvements mandated by the Americans with Disabilities Act, we were able to wheel her to almost all the most nostalgic spots both on the battle field and on the campus of Gettysburg College where she had worked for many years. My mother-in-law never held any job title higher than Executive Secretary to the college president, but her contributions through her working career have provided her with competent and caring medical coverage in the thirty-five years (so far) since her retirement. We stopped off at the post office to mail some Gettysburg history and other used books that we had picked up; since we were in no hurry to get these the cost was just under $8.00 to ship the 12”x12”x12” box across the country. Throughout our trip we stayed in close touch with my mother and two children via Internet email (formerly known as ARPANET, developed and still maintained by the US Defense department). Safe air travel, flight technology, space exploration, highways, postal service, national heritage parks, handicapped access, secure old age, Internet communication…. Folks who complain about your taxes – What part of this heritage, these services would you not want to support? I’m happy to pay my fair share for all these things and many more that I could never accomplish on my own. Thanks for sharing your nostalgic visit with your MIL. I especially liked the squibs about your hiking through the Dordogne in one of our favorite countries.